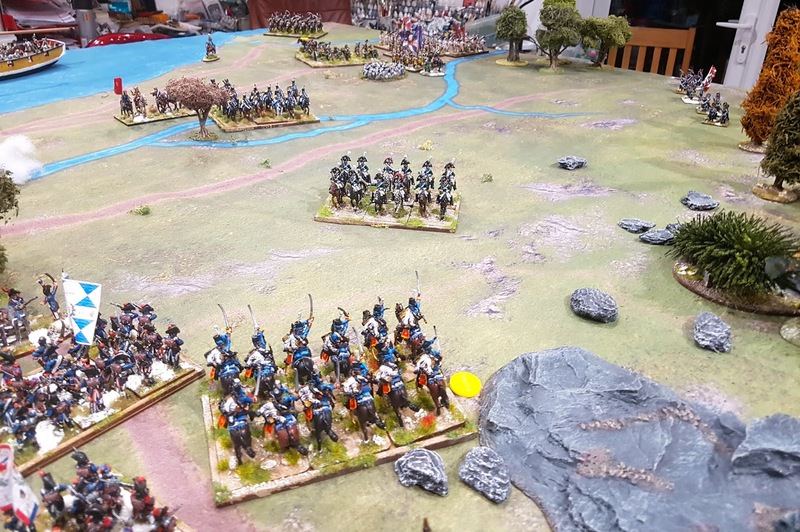 John came over on Wednesday evening for a game so I reset the table for Zurich and organised the armies around Black Powder this time, as I had just received my copy of BP2. I will give my opinion of the rules in another post, but I have already noticed a couple of glaring typos/type setting bloopers, and it would have been useful to summarise all the changes in the rules somewhere, not that there are that many. Anyway, I shall get my hi-lighter pen out another day, so on to the battle. What a bloody disaster for the French (me). We outnumbered the Russians but half my army didn’t get more than a single move onto the table thanks to some dire command rolls. One demi-brigade and a battery of 12pdrs never even made it onto the table! 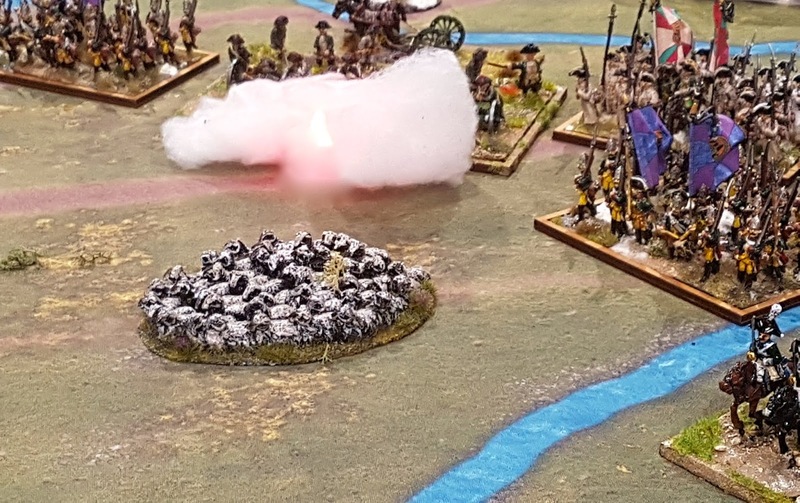 My right flank brigade got bogged down in rough rocky ground, although as they only ever passed two command rolls the entire game that factor doesn’t really matter. My left hand brigade likewise made a swift advance in their first move but were then pinned by Russian cavalry, effectively blocking the exit of the mountain pass that they’d appeared from, so as I mentioned earlier three battalions and a battery of 12pdrs were gridlocked off table. My cavalry brigade also failed to appear on time, and their attached horse artillery never made it at all. While all this was not going on, my centre advanced, my hussars and dragoon’s drove off the Russian hussars but were in turn pushed back and ultimately broken, shaken or driven off the table. The infantry pushed forward, forcing some Russian jäger to retire but then John counter attacked with his grenadiers and went through my infantry like a knife through butter. It was horrible. In no time at all the centre was broken and in full retreat. 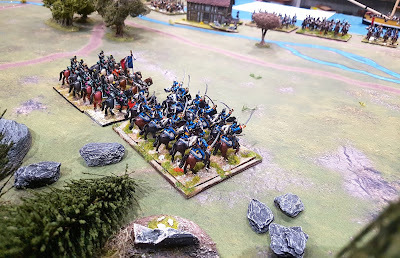 Ok, two of the Russian grenadier battalions were knocked about and the Russian cavalry on that flank was likewise somewhat battered, but it couldn’t have got much worse. Here are a few photos of the French disaster. Of course, had we been able to play on I would like to think that the French would have overcome their early reversal, at least on the left flank, and pushed the Russians back into Zurich. Hahahahahahaha! 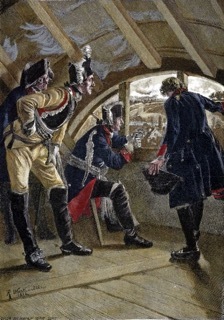 The French advance guard on the south of the river. 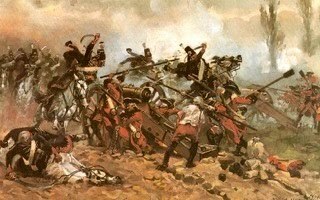 They charged the Russian hussars, drove them off shaken but then had to withdraw themselves. 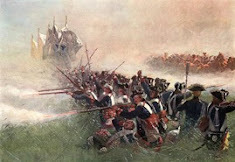 South of the river the main body of French advanced under fire from Russian jager in the wood and artillery outside Zurich. They cleared the wood but were held up by Russian cavalry threatening their right flank and a counter attack by Russian grenadiers. The extreme left wing of the Russian army. 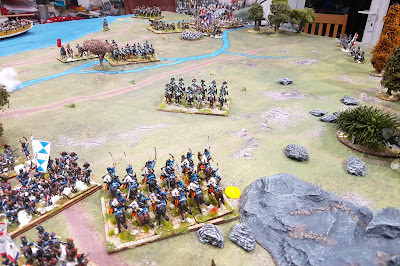 The French tasked with attacking them were bogged down in the rocky terrain so the regiment of dragoons was able to threaten my centre. Russian artillery - obviously the sheep are deaf! 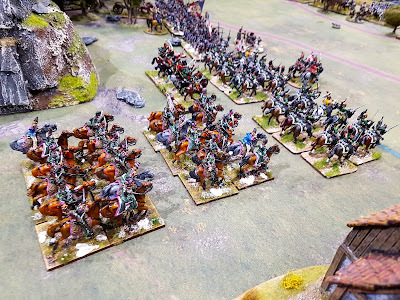 My victorious cavalry having seen off the Russian hussars. 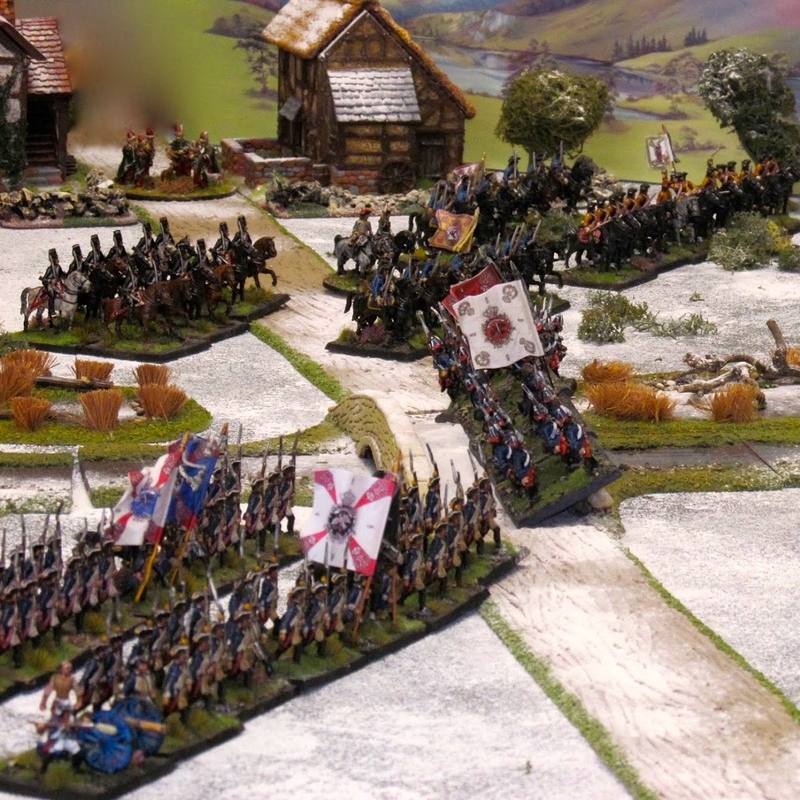 John's hussars recovered and moved up in support of the dragoons who charged my shaken 5th Hussars, breaking them. North of the river part of my force emerged from the mountains ready to advance. 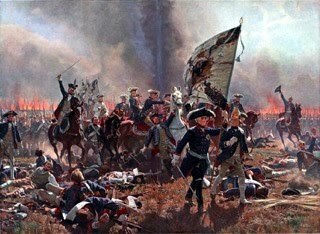 They were pinned and forced into square by the advancing Russian cavalry. 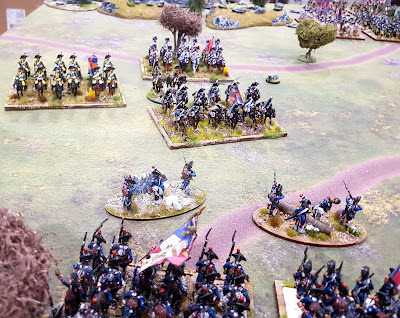 Finally the French cavalry brigade made an appearance, minus its horse artillery battery! The indestructible Russian grenadiers ploughed through three battalions of French, leading to the ruin of main body in the centre, which was broken and out of the game. At this point, and with it being a 'school night' a conceded defeat. My centre was broken, my right was stuck and suddenfly very outnumbered although my left was in good order and strong enough to drive the Russian back into Zurich. Perhaps. I'm not sure I want to use BP2 or even BP1 for Battleground, as I feel General d'Armee gives a better game. We shall see. Brilliant looking game. Zurich is a battle I am interested in refighting and I apprecaite your work on this battle..
or Zurich put to rights if your Russian .. I feel i may have benefited from Massena (Colin) having an off day (poor dice) and my CinC being kept safely somewhere downtown in Zurich. Although to be fair, there was a fair amount of blundering by both sides, although more so of the 'Retreat' nature! 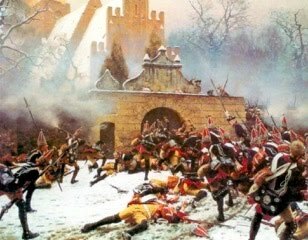 Our post battle debrief concluded that the Russian Grenadiers were greatly over rated for this period and army. They were practically unstoppable but that is a tweak to the OOB to correct. 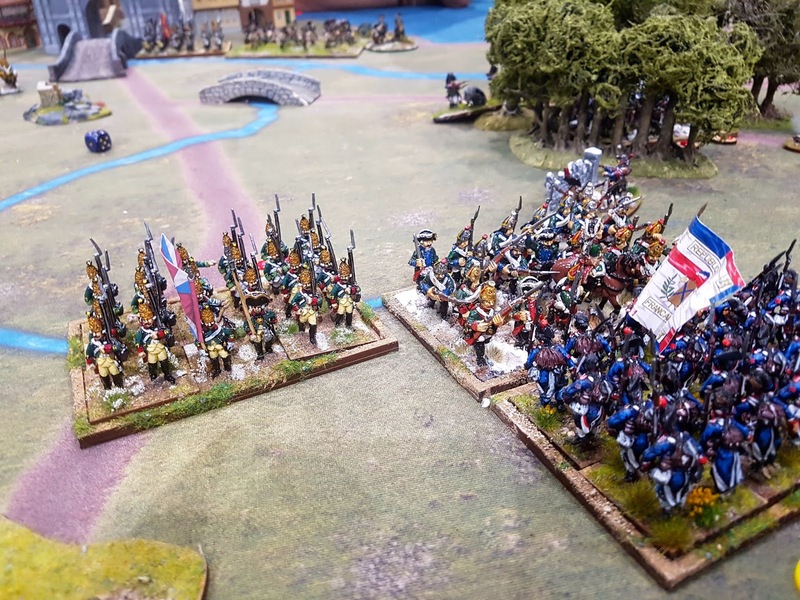 We also considering whether the Russians should have been a tad more linear and slower compared to French, say 9" moves rather than 12" to give more weight to our belief the late FRW French were more manoverable than most of their opponents. Tried couple new rules but not chance to explore more yet. There's an interesting interview with Rick Priestley about this latest version of his rules on YouTube. I've never used them myself and don't intend to having read various accounts from players using them. Your game looks excellent as usual and of course the French should have won!